The City of Detroit's Department of Public Works has resumed its collection of yard waste (grass clippings, leaves and so on). 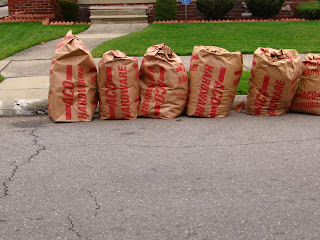 Yard waste collection happens on the same day as our regular trash collection (Tuesday in most of the Warrendale neighborhood). All yard waste must be placed on the curb at least six feet from the Courville container in biodegradable paper bags or a personal garbage can. DPW will not collect yard waste in plastic bags. Residents who set out yard waste more than 24 hours before their scheduled pick-up will be subject to a fine. DPW also offers the following "Dos" and "Don'ts" as it purtains to yard waste collection. DO NOT put yard waste in plastic bags. The bags will not be collected, and a fine will be issued. THE CITY'S NEW TRASH FEE, IS A DISATER - THAT MANY PREDICTED IT WOULD BE. WE NEED A MONTHLY BULK PICK UP PROGRAM - NOW..
PEOPLE ARE DUMPING TRASH IN THE ALLEYS, ON VACANT LOTS, BECAUSE THEY ARE LAZY - OR - BECAUSE THEY DON'T HAVE THE MONEY TO TRANSPORT THE BRANCHES, GARBAGE TO THE CITY DUMPS. HIS 'NEIGHBORHOOD INITIATIVE' - HE AND THE CITY DON'T HAVE THE MONEY TO FOLLOW THRU..SO WHEN THE MEDIA GLARE FADES, SO WILL THE EFFORTS. AND WHO IS GETTING THE DEMOLITION CONTRACTS - THE MAYOR'S BUDDY???? AND HOW THE CITY VIOLATED: FEDERAL EQUAL EMPLOYMENT OPPORTUNITY LAWS.. IT'S TO BAD DETROIT HAS HAD BAD GOVENMENT FOR SO LONG..
YOU NEED TO CONTACT THE NEWSPAPERS, THE TV AND RADIO REPORTERS - AND TELL THEM THE TRUTH ABOUT THE POLICE DEPT, THE TRASH SITUATION, AND YOUR PROBLEMS LIVING IN DETROIT. ON W.WARREN, I WAS TOLD IT WAS A TEMP SHUTDOWN..
vote the mayor of Detroit out of office.!!!!!!!!!!!!! When election time comes let's show the mayor how we really feel. Vote the current mayor of Detroit out of office~!!!!!!!!! !